Sky has told TechRadar that it will begin rolling out Sky Anytime+, its free VoD service, to its customers as early as next week. Sky confirmed at a media briefing that the service was going to be a staggered roll out, with Kathryn Downward saying that this decision had been taken to "ensure a smooth customer experience." Customers who registered their interest will be emailed when the service is available to them, and the website at http://www.sky.com/anytimeplus will enable people to log in to their sky accounts and check also. Sky Anytime+ is a free service from Sky, which offers VoD content through your Sky HD box. 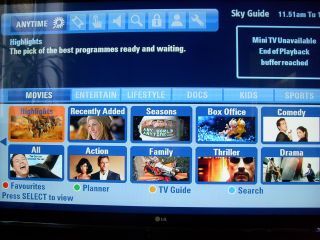 Unlike the current Anytime service offered by Sky, the content comes from the web and is streamed through your Sky box. Currently, the service is only available to Sky customers who also have Sky Broadband installed. TechRadar was given access to Sky Anytime+ this week and has spoken to Sky who explained that the staggered launch of the service for its customers will happen next week. Sky also revealed that the majority of its HD customers, with Sky Broadband, will get the service by the end of 2010. Sky also confirmed to TechRadar that there is a wireless option available at launch - with the option available for £60.